I noticed this graph on Hedgewytch's Tumbling and traced it back to its apparent origin, 3 years ago, on gizmodo. I don't know if the numbers are correct, but the relative costs look about right to me, especially the cost of HP ink. 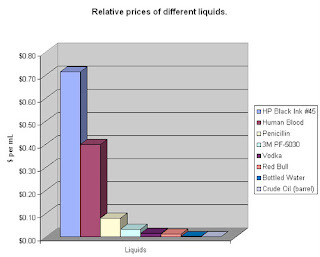 Notice that human blood is cheaper than HP ink. Frankly, I'm not surprised. We have two HP printers. One is a Laserjet 5MP which we've owned for 12 years and has never failed us. It takes large toner cartridges which can be bought relatively cheaply and last a year, even if I'm printing novels. If this printer ever breaks, I think my life will be ruined. The second is a Photosmart 3110. The price gouging on the tiny ink cartridges for HP's recent printers is astonishing and HP, needless to say, go out of their way to make sure cheaper third party replacements won't work. To add insult to injury, the printer keeps track of how long each cartridge has been in and refuses to print if a cartridge exceeds an arbitrary age. The weird thing is, the value for money of the HP products has actually gone backwards. How did that happen? Whoa. I've never seen that graph before, but that's crazy. I often print things at work (shhhh!) because I don't want to have to buy more ink. I send my ms drafts to Kinko's, but that's just because I can't do doublesided at home. Save the trees! 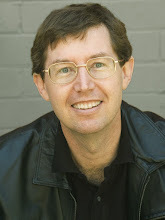 I have definetly saved money on doing some of my editing electronically with my editor and letting some friends read WIP electronically rather than the countless printouts I used to give out. I haven't had a working printer in my home for two years at least. Needless to say, I do not print my novels except on very rare occasions--exactly 1 copy, for my mother, of each of my books--at staples/officemax. She passes them around to the people who won't print their own copies, but want to read the book in the family. I'm thinking a laserjet is probably the best idea for me if I ever decide to work more with hard copies. Those things are incredible. When I finished the first draft of my book and was ready to polish it up and start looking for an agent, I first started looking for inexpensive ways to print off copies for my friends to comment on. The nearest Kinko's is about a hundred miles away and the cheapest I could figure was to print them out on my HP printer at almost $20 (US) per copy. Each copy took most of a cartridge of ink and most of a pack of paper. I printed a hardcopy of the first book 4 times, 3 to give to others and once for my final read, which I've discovered must be printed or it doesn't work. The thing about hardcopy is, it feels like it's set in stone (stone if writing cuneiform, or ink for normal people). It's far too easy for me to think something on a screen can be changed later. Once it's on paper, I know this is it, and I treat the words with a duly critical eye. Which is why my final reads are always covered in a sea of corrections. I tried not printing at all with the second book, and it just didn't work. Once I printed, it forced me to make the hard, final decisions. We're using the same HP Laserjet 5MP we bought just after we got married in 1995. In the interim we purchased a color printer for photos, and it's awful. That's almost exactly our situation, and what I meant. The newer printers just aren't the same value for money. I thought you meant the HP ink printers stink and wanted to add that apparently their lasers also have plummeted in quality. Sorry to have mixed that up. My mother bought an HP color laserjet and she's had a lot of trouble with it because of the archaic menus and options.